This is where we live. On a real farm in the hills of Tuscany. Those cows are out our door and down the slope maybe 150 yards away. Most of the time I don’t think of cows as subject matter that I’d be interested in, but when this double rainbow fell into their field they suddenly became more important to me just by being in the space. It’s the humility that gets to me. They’re not exciting the way wild animals might be. They just ruminate around, eating, lying down, wandering to the pond for a drink and a cool place to be, what a life. I could learn something from them. There are evenings when we walked down the road just to be in their presence. They stand and look, and we do the same, and often something happens that is as simple and ancient as old dutch landscape paintings, with hay ricks and wagons, and farmhouses and sometimes a wonderful weather event in the distance. I don’t know what it is about this ordinariness, but it goes in deep, and I continue to try and find my way to making photographs that tell it right. For a city guy to to be in this kind of country, without the drama of street life, is a lovely problem to take on, especially for a ‘photograph a day’ project. Some days things are very quiet in the country, so making work requires a different kind of openness. 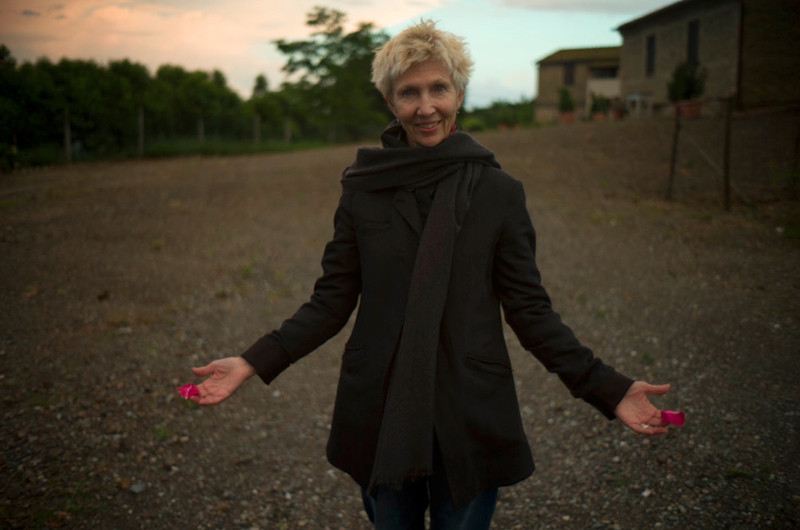 On the walk back to the house Maggie (then the space behind her was bare gravel, and now, 2 years later, it is lush with flowers and clover and trees – a magical transformation made by Maggie) picked up two rose petals which were dazzling in her hands in the low light. 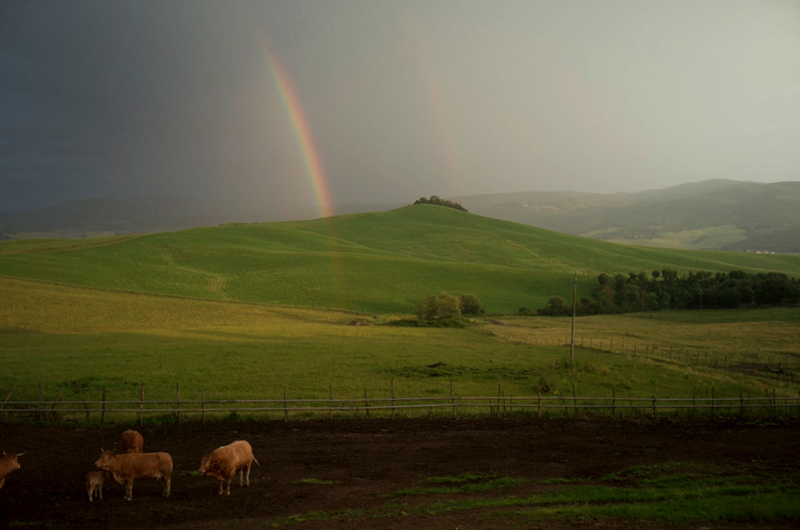 This entry was posted in Rainbow, Tuscany and tagged Landscape, Light, Maggie, Rainbow, Tuscany on June 5, 2015 by joelmeyerowitz2014.